Friday night, Sweet Melissa’s: A small venue for three local groups. On stage stood two men; one tall and one short. One with short hair and the other with dreads that exceed his waist. Both holding microphones, tearing into yet another great verse; ”…We get crazy! Mic turned on the whole room is hazy!…” The crowd hosted a great variety of people — everything from a mom filled mosh pit to a cowboy square dancing in the back. 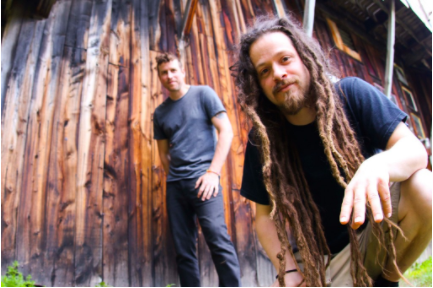 Based in Montpelier Vermont, Boomslang is made up of long time friends Johnny Morris and Dustin Byerly. They have helped to set the bar for the central VT rap scene in the past few years. Boomslang was officially formed in 2006, but Johnny and Dustin were not new to the music scene. Johnny and Dustin met in 2003, when Dustin was searching for a producer. They formed a group of about six people called Therapy. This band only lasted about two years and did not produce any recordings or perform live. Dustin soon learned his friend’s yoga instructor’s boyfriend made hip hop beats, but no one knew his name. They have continued to work together to make great music for over ten years. 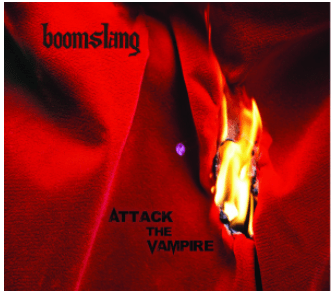 Boomslang released their newest album, Attack the Vampire, on October 27, 2017. This is their second project, following their self titled album, Boomslang, released in 2014. Although concerts naturally have a very high energy, Boomslang has managed to bring the same energy into their recordings. You can see Boomslang perform several times a year in Vermont. For live updates follow their Facebook page here. Each verse is 16 bars total. One bar is a collection of four beats. In each bar there is a flow, rhyme scheme, and cadence set in place. Generally, this flow won’t change much through the song. I made a visual representation of the rhyme scheme in the first two bars of the first verse. The words or syllables with the same highlight rhyme with one another. You may notice that some syllables don’t rhyme perfectly, but still have the same color. For example, time and life. These are called near rhymes. They are a very commonly used tool in music. Come on A how ya like me now? There ain’t no turning back! This verse doesn’t seem overly serious, and, layered with its dark instrumental, is the perfect representation of the Boomslang sound. There are plenty of spots where the lyrics seem to be pumping up the listener. “Breathe in breathe out, no doubt you the one! Ring the alarm cause the time has come!” This feeling is carried out with wordplay intertwined. “Boom moon to the sun!” This is a double entendre. Boom is both referencing to the name of the group (Boomslang), and at the same time pumping up the listener, saying to go crazy and play the music loud all night. “Where we rock all the ancient ways of crazy!” This bar references the primitive part of a person, directly in reference to music and partying. “Ghost Swayze, purple haze we Demi Moore, more than your average lazy!” Ghost is a movie starring Patrick Swayze and Demi Moore. On top of that, Purple Haze is the name of a song by Jimi Hendrix and became the name of “Monterey Purple,” a type of LSD that was very famous in the 70’s. This song is geared towards partiers. It is high energy, has wordplay, and fits nicely into the Boomslang sound. If you would like to listen to the song (as well as the rest of their new album), follow the link below.